Twitter will create tiered, paid access to the Twitter APIs – effectively turning their free services into revenue generators. Will begin to incorporate a video layer, a la Seesmic, into their native apps. As their userbase grows, Pinterest will create an ad network around their currently existing Intention Engine so brands can push Direct advertising to users who Pin products and user who like the Pins. At least one smart Pharma marketing agency will create a subsidiary that develops/maintains/manages disease-state (Diabetes, MS, Cancer, Asthma, etc.) online communities. These communities can then be sponsored by Pharma companies, relieving the burden of developing them/maintaining them and the Med-Legal restrictions that come with ownership. Rise of User-oriented platforms for collecting/processing/drawing insights from app developed data (think Nike Fuelband or FitBit – Quantified Self) where the user can develop their own personal dashboard for optimizing their user experience (think MINT.com for health & wellness, but owned, operated, controlled by ME). H(app)athon is an interesting model for this. Apple will finally release a phone with NFC onboard. 2013 will be the year of Big Customer, or what Doc Searls calls Vendor Relationship Management (VRM), where startups and large companies start working on models where customers are part of the sales and marketing process instead of a goal and objective (or worse, target). An environment where the marketplace becomes a level playing field between customers and brands. Customers can gesture their intention to a marketplace for products / services and be provided with real choice, options, and pricing on the customer’s terms. Customers as the point of origination/orientation for the data with personal controls included. VRM is additive to the marketplace – it’s won’t kill advertising or media or PR but it will create a new model of buying and selling based on customer driven INTENTION. The Social Media evolution continues via a combination of technology, usage, user behavior, companies overusing it as yet another marketing “bright shiny object” and the resultant loss of Customer trust. In 2013 you will see more companies bring this work in-house and field their own SoMe teams to manage their communications and user interactions while relying on their agencies to focus on integration with other communications (pr, marketing, advertising) elements. 2013 might be a big year for companies taking more risk in the product development arena by working with and partnering with customers. Social is now an expectation for most companies, especially challenger brands. Expect at least 2 big consumer retailers (Gap, H&M etc.) to more deeply incorporate a dedicated social element into their products, whether by LIKEing or PINning a specific product via the mobile app. Store-digital integration will continue (especially for retailers who have invested in loyalty programs). I predict one or two small startups raise big funding rounds to be the “Video Facebook” and get promptly purchased and mothballed by their new owners. Major Telcos will still jerk their customers around with pricing and bandwidth limits which will limit the potential growth of mobile video sharing in 2013. Expect the rise in more short, bite-sized video content, starting around a content network like ICanHaz. Companies who think they just need an app are either kidding themselves or eating too much of their agency’s dog food. Companies in 2013 need to have all of their websites in a Responsive Web Design format that covers the mobile, table and desktop viewports. Depending on the business/brand, a majority of your traffic could come from mobile/tablet and you want those users to have an experience that is as rich as the desktop, not “close to it”. Mobile advertising will continue to be a “slippery fish” with experience-based ad opportunities like Medialets continuing to grow and a few startups with a different model taking root (see Rare Crowd’s CEO Eric Picard’s great piece “Time for a New Mobile Ad Format” for more). 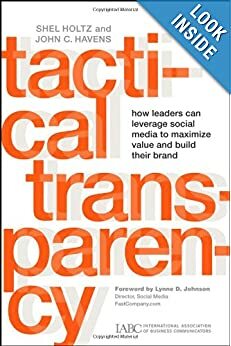 I was interviewed for John C. Havens and Shel Holtz new book Tactical Transparency: How Leaders Can Leverage Social Media to Maximize Value and Build their Brand. When you take them for granted, tell them what they want to hear, get agressive, you may win the battle but you will definitely lose the war. The hard sell, the bum’s rush, the used car salesman process is a waste of energy. It is not oriented to creating a relationship – it wants a sale at all costs. It makes the customer feel pressured, like they didnt get a fair deal.